If you work as a system administrator and your workstation has windows (particularly Windows 7), chances are you connect to the Linux, Solaris, AIX or whatever flavor of *nix using putty. If by any chance you don't you might want to try putty, instead of the current program you're using. I have used putty since I started working as a Unix sysad. And I can tell that putty in itself is a superb and versatile tool. But work starts getting complicated once you have several putty sessions open. And it becomes even challenging once you open more putty sessions. 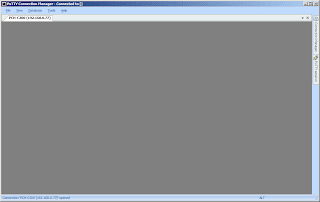 PuttyCM (or Putty Connection Manager) organizes putty sessions into tabs or split windows (by dragging a tab). This way, working becomes organized and much faster. You may want to download PuttyCM to try it out. 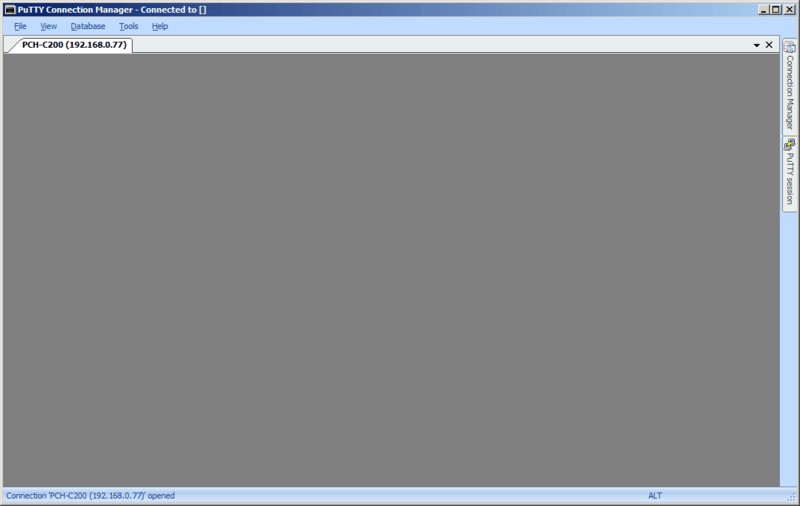 However, PuttyCM doesn't work out-of-the-box in Windows 7. 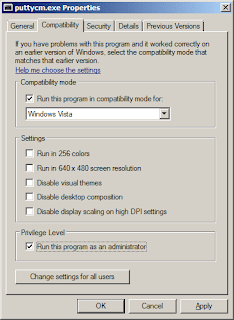 So here's a pimp-my-rig feature designed to guide you in configuring PuttyCM to make it work in Windows 7. To give you a better understanding of what I mean by it doesn't work, here is the screenshot of PuttyCM connecting to my Popcorn Hour C-200 NMJ. As you can see, it doesn't work well. You are able to use the connection manager or putty sessions but it doesn't display the connection properly. And you can't do your job with PuttyCM. So it is just back to plain Putty or so it seems. 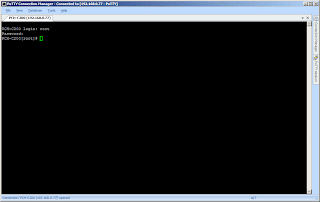 Here's how to make PuttyCM work in Windows 7. Explore to the directory containing the PuttyCM executable (its filename is: puttycm.exe). Right-click the executable file and go to Compatibility tab. 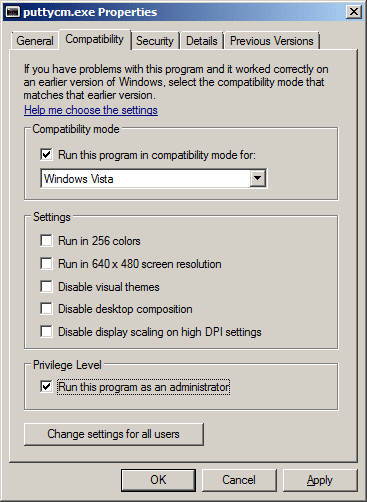 Choose compatibility for Windows Vista. You may choose Vista SP1 or SP2 as these work as well. Toward the bottom of the Compatibility tab, tick "Run this program as an administrator". You will be seeing a window similar to the one below. Now try to launch PuttyCM and connect to a host. How sweet it is to see the terminal connection display. 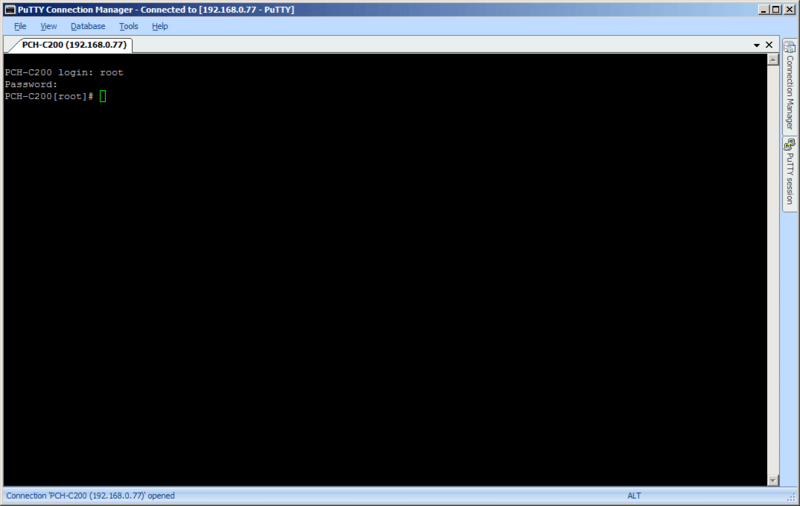 So there you go folks, working tabbed putty with PuttyCM in Windows 7. As of this writing, PuttyCM version 0.7.1 build 136 (beta) works. And the current alpha 0.7.1 build 233 works in Windows 7 and Windows 7 SP1. INFO: What is a "Sticky Bit"?